After a lovely summer in Berlin, it was time to return to the United States. My first stop was Paoli, Indiana, home of my wife's sister's family and their two children. Though I was hoping to taste some good local beer, I didn't have any high expectations for visiting any interesting breweries; Paoli is a small farming town (3700 people) with a strong Amish population. It just didn't strike me as fertile ground for a brewery. And yet, as so often happens, I was wrong. Shortly after arriving, my sister-in-law showed me an article in the local paper featuring a new brewery in the neighboring unincorporated town of Needmore. 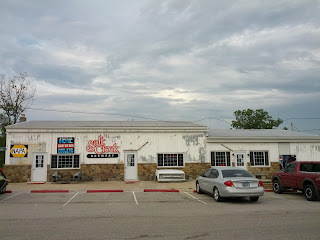 The brewery, which was housed in a converted autobody shop, seemed to be a fairly controversial little watering hole. Positioned on a former-country-highway-now-dead-end-street, it sits across the street from a Baptist Church and down the road from an Evangelical Megachurch. And the parishioners of these churches were none too pleased over this new brewery. 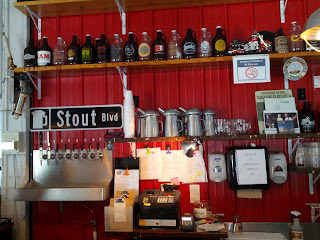 Salt Creek Brewery is owned by Brad Hawkins and Darby Jordan, and arguably has the most unique atmosphere of any brewery I have previously visited. The autobody vibe still hovers, as the building looks more like a gas station than a brewery. Inside, tom-toms and cymbals are used as light fixtures, and the brew kettles sit behind the bar in the former alignment pit. 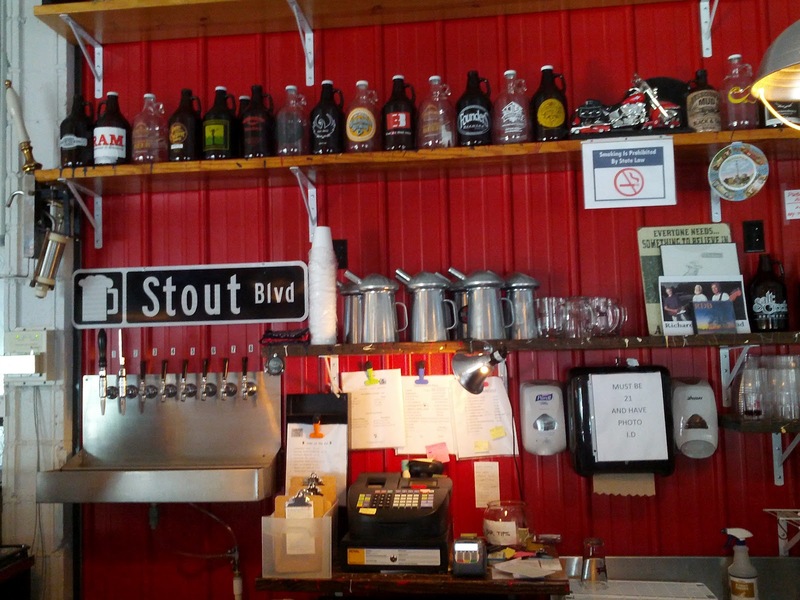 Though open to people of all ages, the brewery definitely caters to an over-21 crowd. 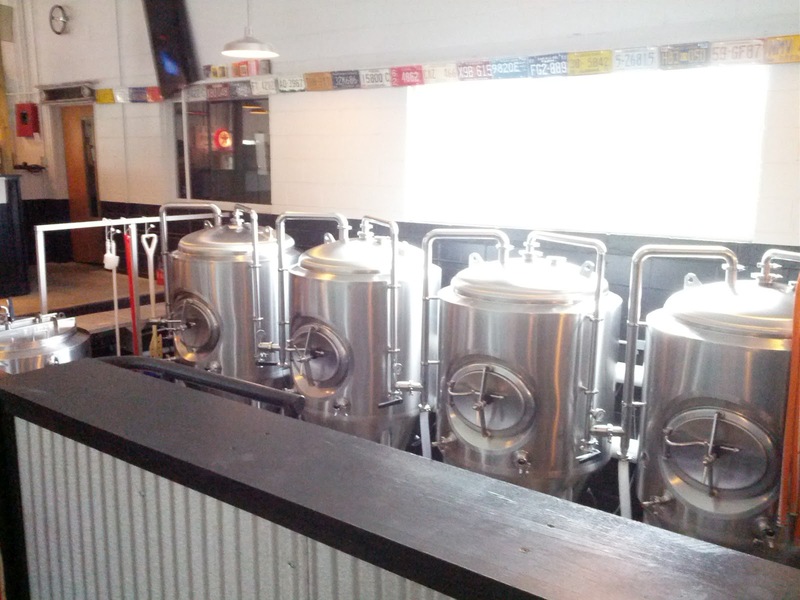 The brewery has two sections: the main brewery with a stage, long bar, and the brew kettles, and a smaller adjacent room with little character. People order food from a window in the smaller room, and if one is over 21, they can take it into the main brewery. Everyone else gets to sit at picnic tables in the rather sterile garage extension. The food was decent, though unremarkable. I ate a pulled pork sandwich which had far too little pork and was served on a store bought hamburger bun. My sister-in-law had a ruben sandwich which was fairly mediocre with very mild flavors and not much sauce. My nephew had a chili dog which, in a unanimous decision, was the best dinner ordered (and neither my sister-in-law nor I are hot dog fans). The hot dog was a high quality all beef dog, and the chili had a pretty full flavor with hints of cinnamon. When I visited, the brewery had eight different beers on tap. 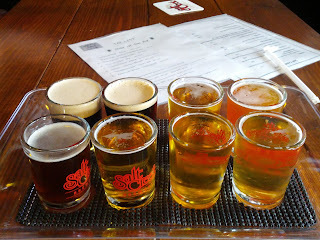 All of the beers were well made, and, in my opinion, catered to an audience that was unfamiliar with craft beer. 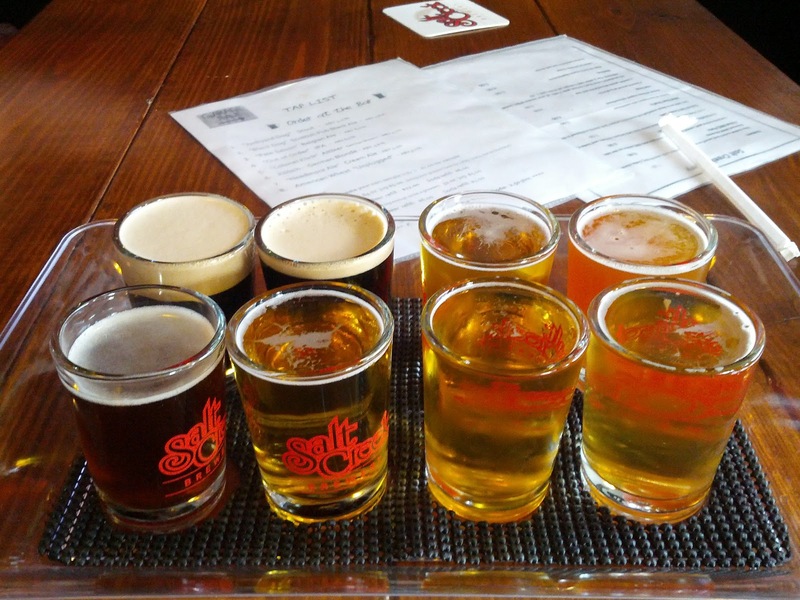 Thus, the majority of the beers were fairly conservative examples of their respective styles, but all very drinkable and well made. My personal favorite of the eight was the Colonel Klink Alt, a 5.1% German Alt with a full nutty/caramel flavor and a mild hop backdrop. Also quite good was their Black Dog Scottish Ale, a low carbonated 4.8% inky black ale, with bits of coffee and a silken mouthfeel. The Out of Order IPA was incredibly mild with, according to the brewer, just barely enough Cascade hops to qualify as an IPA under the BJCP guidelines. There's no doubt that Hawkins and Jordan have the chops and the creativity to be successful brewers. All they need now are a few disciples. Times-Mail, May 22, 2012. Article by Krystal Shelter.